Samsung just announced the annual model upgrade to their successful flagship lineup. The Samsung Galaxy S8 and Samsung Galaxy S8+ is the latest to consider. It’s a complete redesign from the S7 and S7 Edge so mounts that may have fit your old phone may not fit the new models. They made these phones larger than the prior generation which is a bit of a surprise. The Samsung Galaxy S8 comes in with a 5.8 inch diagonal screen and measures 5.86 inches tall by 2.68 inches wide by .31 inches deep. The Samsung Galaxy S8+ is even larger. Sporting a crazy large 6.2 inch diagonal screen and measuring 6.28 tall x 2.89 wide x 0.32 in. These are the all important measurements needed for selecting a mount. Samsung has continued the beveled edge design. It takes a little getting used to but can be somewhat mitigated with the use of a decent case. A lack of something around the edges will result in constant mistaken application starts. So be sure to add in the dimensions of a good case which we strongly recommend. These are expensive phones. Get a case for it. We have always liked the Otterbox Defender series which we reviewed here, and should provide excellent protection for the Samsung Galaxy S8 or Samsung Galaxy S8+. Sure, it adds a bit more bulk, but you will appreciate it if you drop the phone. We also have tried and can recommend the Unicorn Beetle for the older Samsung Galaxy S7 Edge and liked it so would expect similar satisfaction for the Samsung Galaxy S8 and S8+ models. On to the mount discussion. We continue to favor well made mounts with expandable cradles to fit protective cases. With expandable cradles, you also have the opportunity to reuse your mount when you upgrade your phone. All of the mounts we recommend should fit both the Samsung Galaxy S8 or Galaxy S8+ with or without a case or skin. There are lots of places to mount your Samsung Galaxy S8 and S8+ in a car. The windshield is always the most popular location to mount especially if you plan to use it as a GPS with my favorite application which is Waze. With the Samsung Galaxy S8 and S8+ coming in a bit larger than most phones, we will recommend a larger mount for the windshield. Consider the Arkon Slim Grip Ultra Travel Mount for both model phones. The cradle opens to over seven-inches which is easily large enough to hold either phone with or without a case. This mount includes a cradle with a spring-loaded feature and legs which can be moved from side to side to leave any port on your phone exposed to run cables. The mount that can be adjusted at the base and the cradle. The phone can swivel 360 degrees. A terrific feature is the inclusion of an adhesive dash disk to turn your windshield mount into a dash mount. This is excellent for states that may not allow mounting to a windshield. We wrote a detailed article on this topic which can be read here. Let’s move on to another popular location for most smartphones which is the vent. One of our favorites has been the Square Jellyfish Jelly-Grip Car Air Vent Mount. That’s the mount that is in the accompanying photo with this article. The Square Jellyfish Jelly-Grip will hold the Samsung Galaxy S8 and S8+ with or without a case. It has a ball and socket so the cradle swivels into any orientation. This mount will work on flat vent slats that are 3/8 to 1 inch deep. The included cradle opens to 3 5/8 inches which gives us plenty of room on the sides. Another interesting location is a CD player. Does anyone use these any longer? Use it for your phone. 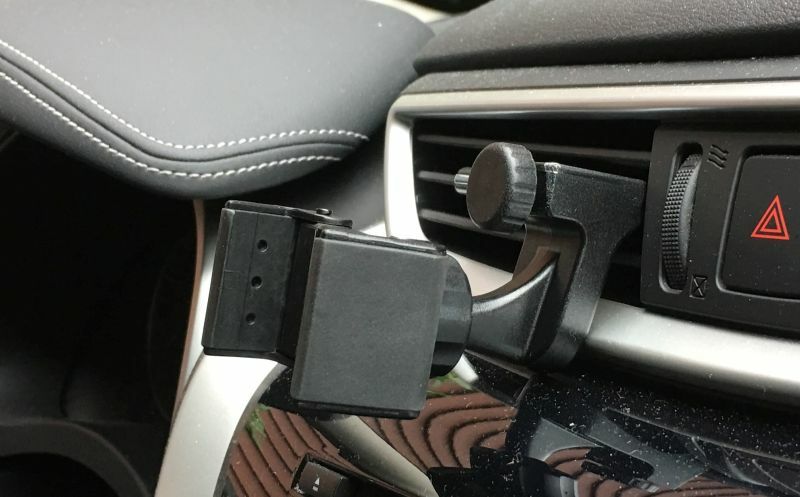 The Taotronics CD Slot Phone Mount is a good one to consider. The mount fits into the CD player slot. Just turn the locking knob to adjust the fins for a secure hold within the CD player. The included cradle opens to 3.94 inches and rotates into landscape or portrait. This will fit both the Samsung Galaxy S8 and S8+ with a case or without. For motorcycle use, it’s important that you select a mount that has a well constructed cradle that is going to hold your Samsung Galaxy S8 or S8+ very tightly so that it stays put through the vibration of a ride. We’re going to recommend the RAM X-Grip line. These are heavy-duty mounts made for motorcycles and feature a lifetime warranty. The mount has gone through some rigorous shake tests and holds up well on a motorcycle. We wrote about X-Grips extensively on this site and you can view that article here. Consider the RAM X-Grip IV Handlebar Mount for both the Samsung Galaxy S8 and S8+ . These mounts feature the expandable X-Grip IV cradle which can open to 4.5 inches. RAM recently added a tether to these cradles, so be sure to buy one from recent stock or add a tether. We always recommend tethering your device for added security. So that’s some of our recommendations for this great new line of smartphones. Remember, all mounts suggested will fit both the Samsung Galaxy S8 and S8+ phones.